CHAPPAQUA, NY—In a press conference announcing her plans for the 2020 election, Hillary Clinton told reporters she is launching a campaign Tuesday that will raise $100 million by the end of the year or else she will run for president. 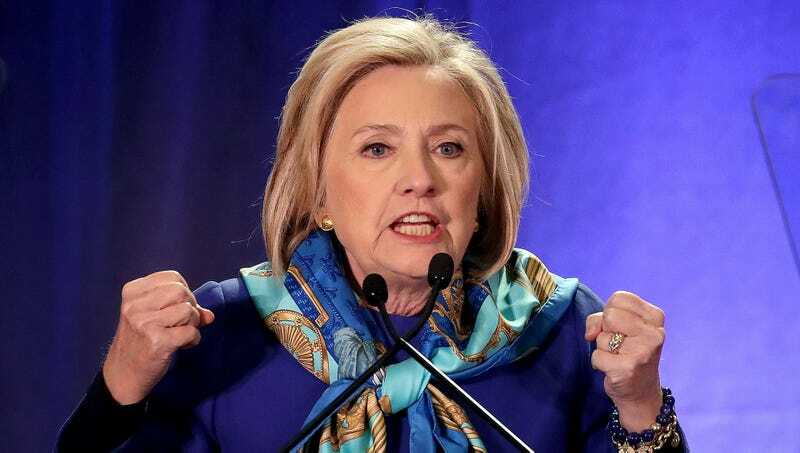 “I’m very excited to roll out my initiative to secure this full amount within seven weeks, and if it is not successful—let me be very clear on this—I will once more fill out the paperwork to run for president and submit it to the Federal Election Commission,” said Clinton, who stressed that she was “absolutely serious” about her new A Hundred Million Or Me campaign, describing the town halls and candidate meet-and-greets she would soon begin holding in Iowa and New Hampshire if donors came up even a penny short. “What I’m asking you to do is picture—and picture very vividly—the following things: Lawns plastered with ‘I’m With Her In 2020’ signs, continuous television ads showcasing my strenuous attempts to appear enthusiastic, entire news cycles once more given over to my use of a private email server as secretary of state. That’s one possibility. The other is you give me $100 million. Up to you.” At press time, sources confirmed Clinton had raised $17.6 billion in the first 45 seconds of the campaign.